Hubs are dimensioned to clear the stock cast-in timing tab. The damper face for pulley mounting will be forward of the OEM location by: .150'' for 2-ring internal balance, .450'' for 3-ring internal balance, .750'' for 3-ring external balance. Hubs may be shortened by the listed amount for internal balance and .600'' (.150'' fwd of OEM) on external balance if the tab is cleared, or order ATI cover with adjustable tab (part # 085-916259). 2-ring internal balance can be installed in the OEM location with minor clearancing of the timing tab and retain OE timing mark. 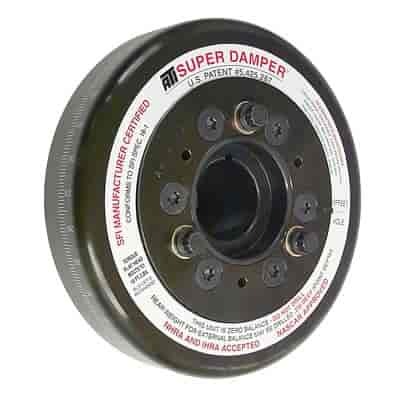 Aluminum hub OEM front (part # 085-916255) is OK for 2 ring dampers. 918282E is rated 5.0 out of 5 by 2. Rated 5 out of 5 by Old Country from ATI Damper - Best there is! This ATI Damper is exactly what you expect - great quality, finish, packaging.